Mrs.Kristin Ward has been teaching for 6 years. Five of which have been here at CWMS and one year in Watauga County. She has taught 7/8th-grade math, 7th/8th-grade science, and 8th-grade social studies (her favorite is 8th-grade math). When asked why she loves teaching she responded with the following: "I love teaching at CWMS because the students at this school are hard working, funny, caring kids and they will have your back in a minute if you need them! The staff at CWMS is also a big part of why I love it here. It feels like family every single day when I go to work. I love being a teacher because I have the opportunity to be a positive influence in my student's lives and help them realize their potential." 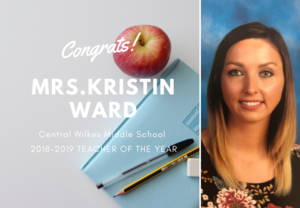 Mrs.Ward has been married for 8 years and is the mom of two toddler boys, Justice and Avery. They love to go hiking, watch football (go Panthers!) and read. In her free time, she likes to workout or watch anything to do with History.